The present protocol describes a mouse microsurgery infusion technique, which effectively delivers substances directly into the brain via the internal carotid artery. Leda, A. R., Dygert, L., Bertrand, L., Toborek, M. Mouse Microsurgery Infusion Technique for Targeted Substance Delivery into the CNS via the Internal Carotid Artery. J. Vis. Exp. (119), e54804, doi:10.3791/54804 (2017). Animal models of central nervous system (CNS) diseases and, consequently, blood-brain barrier disruption diseases, require the delivery of exogenous substances into the brain. These exogenous substances may induce injurious impact or constitute therapeutic strategy. The most common delivery methods of exogenous substances into the brain are based on systemic deliveries, such as subcutaneous or intravenous routes. Although commonly used, these approaches have several limitations, including low delivery efficacy into the brain. In contrast, surgical methods that locally deliver substances into the CNS are more specific and prevent the uptake of the exogenous substances by other organs. Several surgical methods for CNS delivery are available; however, they tend to be very traumatic. Here, we describe a mouse infusion microsurgery technique, which effectively delivers substances into the brain via the internal carotid artery, with minimal trauma and no interference with normal CNS functionality. In vivo models of central nervous system (CNS) diseases require an effective delivery of exogenous substances, such as drugs, pathogens, or exosomes, into the brain. Therefore, an ideal delivery method should cause minimal trauma to the animal, preserve the integrity of the neuronal network, and achieve high substance concentrations in the brain 1. Several surgical methods of local substance delivery have been described, including intra-sheath, intracerebral, and intraventricular injections or implants 2,3,4,5. These approaches, however, are considered traumatic to the CNS, and allow administration of only low volumes of the substance of interest. Moreover, it has been suggested that exogenous substances can be rapidly removed by the cerebrospinal fluid 6, and a low penetration range to the brain parenchyma has been observed 7 when the above-mentioned techniques are employed. Systemic delivery methods, such as oral, pulmonary, subcutaneous, and intravenous routes, are more commonly used in animal models, though they exhibit low effectiveness in delivering the substances to the CNS, due to uptake by other organs 8,9. Therefore, these routes of delivery require elevated doses of the administrated substances, increasing the risk of side effects and toxicity 10,11. Here, we describe a mouse infusion microsurgery technique, which effectively delivers substances directly into the brain via the internal carotid artery. In addition to targeting the delivery to the CNS, this technique does not bypass normal physiological barriers and is therefore highly relevant to biological processes involved in the passages of therapeutics or pathogens into the brain. The procedures involved in the following protocol have been approved by the University of Miami Institutional Animal Care and Use Committee (IACUC). In addition, all procedures are being conducted in facilities approved by the Association for Assessment and Accreditation of Laboratory Animal Care International (AAALAC). Anesthetize mouse with isoflurane mixed with oxygen, using a laboratory anesthesia system. Use isoflurane at setting between 4-5% and oxygen flow at 2 L/min on the commercial machine (See Materials Table). Transfer the animal to the surgery surface, under a stereomicroscope, and sustain anesthesia using a nose cone (use isoflurane setting 1.5 - 2.5 and oxygen flow at 2 L/min). Ensure that the mouse respiratory rate is around 1 - 2 respiration/sec without gasping. In addition, ensure that the animal does not exhibit whiskers stimulation reaction and pedal reflex (toe pinch). Monitor respiration rate and effort during the surgery, at least every 5 min. Follow specific Institutional Animal Care and Use Committee and veterinary guidelines for rodent anesthesia monitoring. Apply a drop of ophthalmic lubricant on each eye using a sterile swab in order to prevent dryness. Administration of anti-inflammatory and analgesic to alleviate discomfort is recommended. With the animal lying on its back, maintain anesthesia using a nose cone. Clean the animal's neck area by wiping the area three times with ethanol 70% and chlorhexidine. Shave the animal's surgery area using a razor (detailed below). Perform the entire microsurgery procedure under a stereomicroscope. Using surgical scissors and forceps perform a shallow midline incision in the neck, from above the breastbone to below the jaw (about 3 to 4 cm). Using forceps carefully separate fatty and connective tissue to expose the trachea. Place a pillow (round object, about 0.5 cm in diameter) on the back of the neck of the mouse to extend the neck, further exposing the area. Separate the tissue using either a tissue retractor or hooks. On the animal's left side of the trachea, carefully tweeze apart the connective tissue to expose the left CCA. Using forceps carefully remove all connective tissue to expose the CCA bifurcation, and the beginning of both external and internal carotid arteries. Insert two segments of nylon suture (about 1 cm each) under external carotid artery (ECA), using forceps. Place a permanent knot at the highest point possible of the ECA. At the lowest point possible of the ECA, immediately above the CCA bifurcation, place a removable knot. This knot should be loose compared to the upper knot. Close the CCA using a vessel clip, at the lowest possible point. Close the internal carotid artery (ICA) using a vessel clip. Using microdissection spring scissors perform a small cut in the ECA (about 2 mm), between the two knots. Assemble an infusion system. Attach 6 inches of capillary tubing (ideal dimensions: 2.5 mm x 1.2 mm) to a tuberculin syringe containing 250 µl of the substance to be infused (drugs, pathogens, extracellular vesicles, among others) and insert the capillary tip gently into the incision performed in step 3.6. Continue to slide down the capillary until it reaches a midpoint between the bifurcation and the clip closing the CCA. Tie down the lower ECA knot. Verify that the knot is loose enough to allow capillary fluidity and tight enough to prevent leaking. Remove clip from the ICA. Gently apply pressure to the syringe piston allowing substance infusion at approximately 10 µl per second. Place clip back on the ICA. Gently remove the capillary tubing. Tie down the lower ECA knot completely. Remove clips from the ICA and the CCA. Remove retractor or tissue hooks and pillow. Clean suture area using sterile saline. Close the incision using nylon suture/needle and forceps. Administer anti-inflammatory and analgesic to alleviate post-operative discomfort. Place animal in cage placed on heating pad for at least 1 hr and monitor recovery. The mouse infusion microsurgery technique described here is very versatile and has been used to deliver different substances directly into the brain, including the delivery of tumor cells in a representative model of brain metastasis formation 1,12. This technique is also suitable to assess the pathological aspects of different pathogens in the CNS. In a mouse model of HIV infection, the infusion surgery was used to inject viral particles directly into the CCA. We found that 7 days after surgery, the CNS was positive for HIV by real-time PCR. Furthermore, the ipsilateral hemisphere infection was 6-10 folds higher than the contralateral hemisphere (Figure 2). Another suitable approach of the infusion surgery described here is to deliver extracellular vesicles (ECVs), mainly exosomes, into the CNS. Figure 3 shows the presence of CD63, a marker for exosomes, labeled with green fluorescent protein (GFP) in the ipsilateral brain of a mouse 24 hr after infusion. Figure 1: Schematic Representation of the Infusion via the Internal Carotid Artery. In the insert (a) and (b) depict the localization of the upper and lower knots, respectively; (c) represents the small cut in the ECA, through which the capillary tubing is inserted (gray line). Please click here to view a larger version of this figure. Figure 2: HIV Detection by Real-time PCR after Viral Infusion via the Internal Carotid Artery. Bars indicate mean HIV DNA levels harvested from mice 7 days post the infusion via the left internal carotid artery. Error bars depict standard deviation. Please click here to view a larger version of this figure. 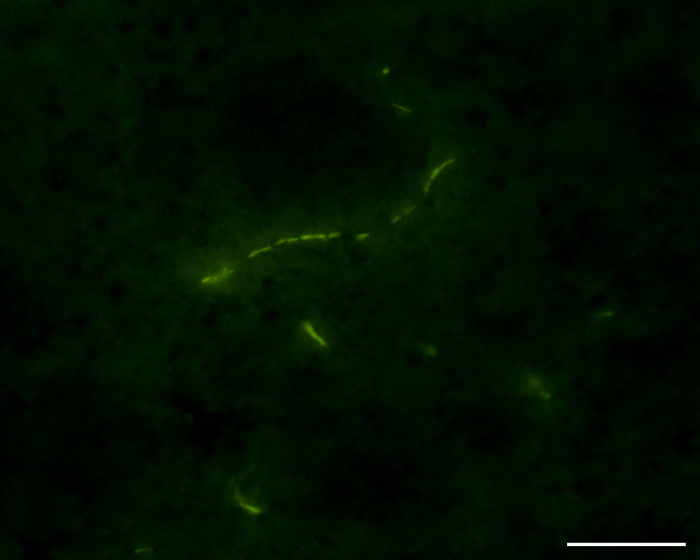 Figure 3: Immunofluorescence of Mouse Brain Section Depicting GFP-tagged CD63, an Exosome Marker, after ECVs Infusion via the Internal Carotid Artery. The representative image depicts a mouse brain microvessel associated with CD63 expressing ECVs (green). Scale bar: 50 µm. Please click here to view a larger version of this figure. The infusion microsurgery described here has been proved to be very successful in delivering exogenous substances of various biological features into the CNS, preventing unwanted dissemination throughout the body 1,12. Disruption of the blood-brain barrier is a pathological characteristic of several CNS-related diseases; therefore assessing the relationship of exogenous substances with the blood-brain barrier is of major importance and interest. This surgery model presented causes limited trauma to the animals and is associated with very low mortality 1,12. Moreover, the procedure does not interfere with the CNS function or cerebral blood flow 1,12. The most critical aspect of this procedure is to perform the correct cut in the ECA, which should only allow the insertion of the capillary tubing. A wider cut will cause leaking of the substance to be infused, requiring another ECA surgery on the opposite site. In order to prevent this situation, the capillary tubing should have a bigger diameter than the cut, and should also have a sharp edge in order to facilitate its entrance through the artery. Regarding the technical aspect, a fully trained personnel is able to perform this surgery within 20 minutes. The major limitation of this technique is the possibility of infusion only once through the same ICA. For repeated substance delivery into the CNS, a vessel microport needs to be used and has been described previously 1.The technique described here has the potential to assist in the studies on new positive and negative interactions within the BBB, as well as to deliver pathogens, drugs, and physiological agents into the brain. We would like to thank Dr. Lei Chen (Icahn School of Medicine at Mount Sinai, NY) who first established the use of this model in our laboratory, and to Dr. Gretchen Wolff (German Cancer Research Center, Heidelberg, Germany) for disseminating the technique in our laboratory. Supported in part by HL126559, DA039576, MH098891, MH63022, MH072567, DA027569, and NSC 2015/17/B/NZ7/02985. 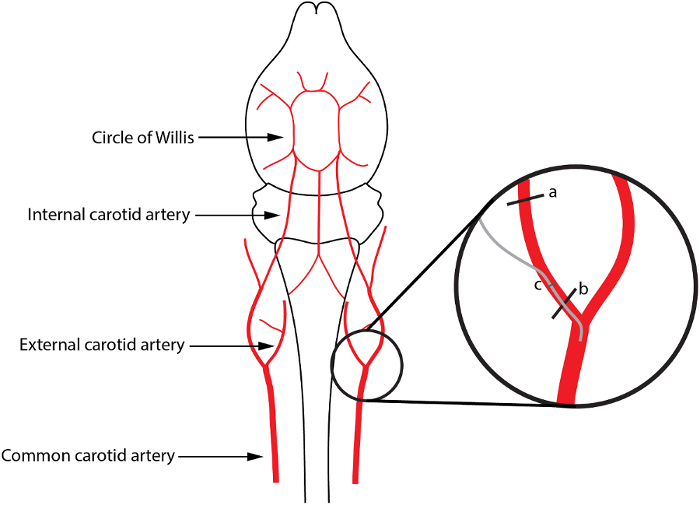 Chen, L., Swartz, K. R., Toborek, M. Vessel microport technique for applications in cerebrovascular research. J Neurosci Res. 87, (7), 1718-1727 (2009). Frisella, W. A., et al. Intracranial injection of recombinant adeno-associated virus improves cognitive function in a murine model of mucopolysaccharidosis type VII. Mol Ther. 3, (3), 351-358 (2001). Wei, L., Erinjeri, J. P., Rovainen, C. M., Woolsey, T. A. Collateral growth and angiogenesis around cortical stroke. Stroke. 32, (9), 2179-2184 (2001). Wu, G., et al. Targeted delivery of methotrexate to epidermal growth factor receptor-positive brain tumors by means of cetuximab (IMC-C225) dendrimer bioconjugates. Mol Cancer Ther. 5, (1), 52-59 (2006). Pignataro, G., Studer, F. E., Wilz, A., Simon, R. P., Boison, D. Neuroprotection in ischemic mouse brain induced by stem cell-derived brain implants. J Cereb Blood Flow Metab. 27, (5), 919-927 (2007). Sugiyama, Y., Kusuhara, H., Suzuki, H. Kinetic and biochemical analysis of carrier-mediated efflux of drugs through the blood-brain and blood-cerebrospinal fluid barriers: importance in the drug delivery to the brain. J Control Release. 62, (1-2), 179-186 (1999). Pardridge, W. M. Drug and gene delivery to the brain: the vascular route. Neuron. 36, (4), 555-558 (2002). Vantyghem, S. A., Postenka, C. O., Chambers, A. F. Estrous cycle influences organ-specific metastasis of B16F10 melanoma cells. Cancer Res. 63, (16), 4763-4765 (2003). Huang, R. Q., et al. Efficient gene delivery targeted to the brain using a transferrin-conjugated polyethyleneglycol-modified polyamidoamine dendrimer. FASEB J. 21, (4), 1117-1125 (2007). Liu, R., Martuza, R. L., Rabkin, S. D. Intracarotid delivery of oncolytic HSV vector G47Delta to metastatic breast cancer in the brain. Gene Ther. 12, (8), 647-654 (2005). Kumar, P., et al. Transvascular delivery of small interfering RNA to the central nervous system. Nature. 448, (7149), 39-43 (2007). Wrobel, J. K., Wolff, G., Xiao, R., Power, R. F., Toborek, M. Dietary Selenium Supplementation Modulates Growth of Brain Metastatic Tumors and Changes the Expression of Adhesion Molecules in Brain Microvessels. Biol Trace Elem Res. (2015).